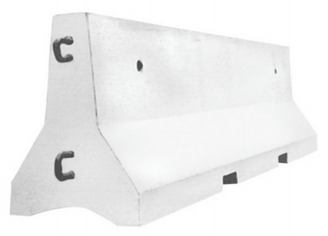 An RCC Jersey barrier or Road Barrier is a modular concrete barrier employed to separate lanes of traffic. It is designed to minimize vehicle damage in cases of incidental contact while still preventing the crossover case of a head-on collision. Jersey Barriers are also used to reroute traffic and protect pedestrians during highway construction. Manufactured by M-30 grade of concrete by vibro compaction process. Suitably reinforced to promote long use and to prevent damage during handling, transportation b erection. Reinforced with 8mm dia. Tor Steel at 150mm center to center both ways. The installation time is almost negligible as compared with construction of conventional medians. The specifications of Jersey Barrier make it suitable for dividing roads with high traffic volume and density.